The FanDuel website has been excelling at the one-day format to fantasy sports, making game days even more exciting. The DFS powerhouse continues to grow the total number of players, tournaments, matchups, all which leads to larger payouts. of Daily fantasy competitions provide many advantages for players including the ability for your ideal selection, faster play, and opportunity to win big prize money through numerous different game types. 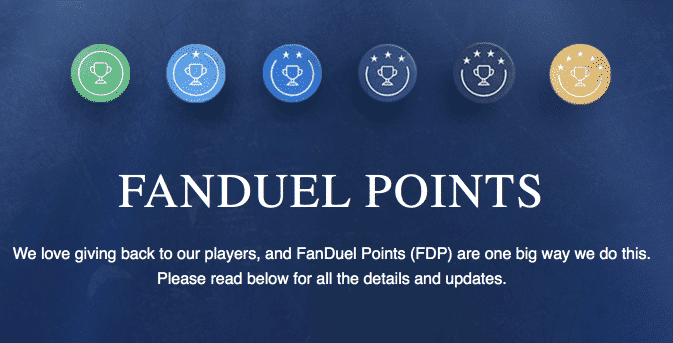 Continue reading our FanDuel review for updates and insight on competitions, legality, and how to claim your new player bonus. FanDuel currently offers a 100 percent match bonus when you first register and deposit on the Daily Fantasy Sports site. 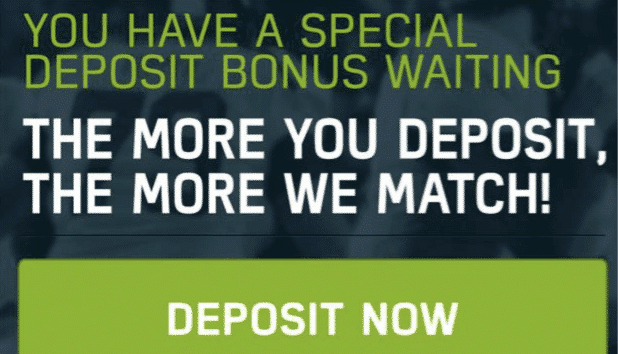 The doubling of your first deposit covers up to $200. The bonus doesn’t require a promotional code and is available through the link when registering and using a viable deposit method. As you get better with strategy and play in more competitions, all your bonus money is unlocked to withdrawal as real cash. The unlock rate for bonus cash is at four percent, which means you are able to withdrawal $4 for every $100 you spend on competition entry fees. Promotional bonuses a the best way to begin playing on FanDuel with extra bonus cash to help boost your bets. There is no Promo Code required to get either the double deposit bonus or the 5 contests for free. Simply use one of our links to sign-up for FanDuel. FanDuel brings the best of fantasy sports in one-day and weekly formats. If you are new to this, the website also offers free practice contests that can get you ready for the paid versions. FanDuel offers you wide choice of sports, contests, and entry fees, giving each and every player a game type fit for them. You also have a choice of creating your own contest that you can play with friends. Apart from these contests, on FanDuel, you can also play freerolls and exclusive contests whenever you qualify with your FDP. Since this is a daily or weekly format, you do not have to wait until the end of season to be paid which is a major upgrade from season long leagues. Choose the players of your fantasy team, and as the games start, each of your players will start earning points. All contestants get the same amount of salary when selecting a lineup. When your team manages to top the competition, you will be paid your winning amount immediately. You can select a team from single-night games, choose the league, and you can enter the play for as low as a dollar. If you qualify for freeroll, with your FDP, you do not have to pay a dime. In tournament play, you always have a chance of winning in the thousands of dollars from a single entry. FanDuel has also made it convenient for players to play fantasy sports from their smartphones or tablets. 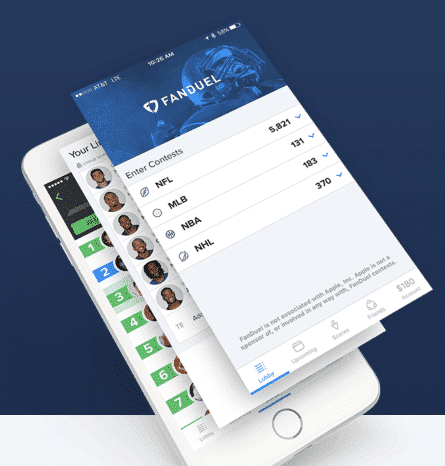 The FanDuel App is presently available for iOS and Android. Apple users can download the FanDuel app from the iTunes App Store for either the iPhone or iPad. If you are an Android user, you can download the mobile app directly from the FanDuel website through accessing it via your Android device. The app has all the features for entering contests and for monitoring scores easily. Contests can be quickly chosen by type, sport, prizes, size, or entry fee, and your fantasy lineup can be entered and edited from a highly convenient interface. Entering multiple contests is also very easy with just a couple of taps. Live score updates and easy review of your past contests with leaderboards and game info is also available. The app also provides easy and secure way for you to make deposits, withdraw cash, and review your account information. All screens are well laid out, and everything is clearly displayed without any clutter. It is possible to access whatever you want with very few taps, and once you get used to the app, entering multiple contests will become second nature. Even for people on the go, the app provides all the conveniences of the actual website, and therefore users have a wide choice of devices to play one-day fantasy sports. The FanDuel website can be accessed from any of the popular browsers, including Chrome, Internet Explorer, Firefox, Opera, and Safari. The website has been designed with new players in mind, which means the interface is extremely easy to navigate and use. The most important format feasibility comes during the player selection portion of the website which includes changing a lineup quickly right before key games start. For experienced players, this is a major plus point, as they can enter multiple contests, monitor live scores, and review their account information with ease. Another major positive advantage is that since the website is very easy to navigate and explore for new users; there is very little chance of your referrals dropping out. New-player friendly translates into better commissions from your referrals. FanDuel is legal in most states within the US, as long you are over the age 18, or 21 in the state of Massachusetts. Some states have temporarily restricted real money Daily Fantasy Sports in order to further conclude if the game is predominantly luck or skill. In Washington, Mississippi, Montana, Louisiana, New York, Iowa, Idaho and Arizona, where there might still be legal issues concerning fantasy sports, FanDuel does not provide paid entry. For residents of all other states, FanDuel makes sure playing these games is legal, as the website complies with all the concerned federal and particular state laws. Through geolocation services which automatically connect you to FanDuel’s servers through an internet connection, FanDuel will always restrict players that are playing from one of the above states. Though only a handful of states in the union do not permit daily fantasy sports, FanDuel has been heavily pushing for complete legalization as a game of skill. Since skill is largely involved in playing daily fantasy sports, these games do not come under the purview of UIGEA (Unlawful Internet Gambling Enforcement Act) 2006, which would constitute their play as legal. Depositing and withdrawals on FanDuel are easy. You can use any major credit card (Visa, MasterCard, and Discover) or PayPal to deposit. All withdrawals are handled via PayPal and may process as soon as the same day. Entry to contests starts at as low as $1, and you can make payments through PayPal or through any of the major credit cards. You have a chance of playing a game, winning, and being paid on the same day. Your winnings are deposited into your account. The website has an elaborate FAQ page, and if your query still remains unanswered you can always contact FanDuel through their email system. To You can expect a quick response from their team of knowledgeable support specialists. 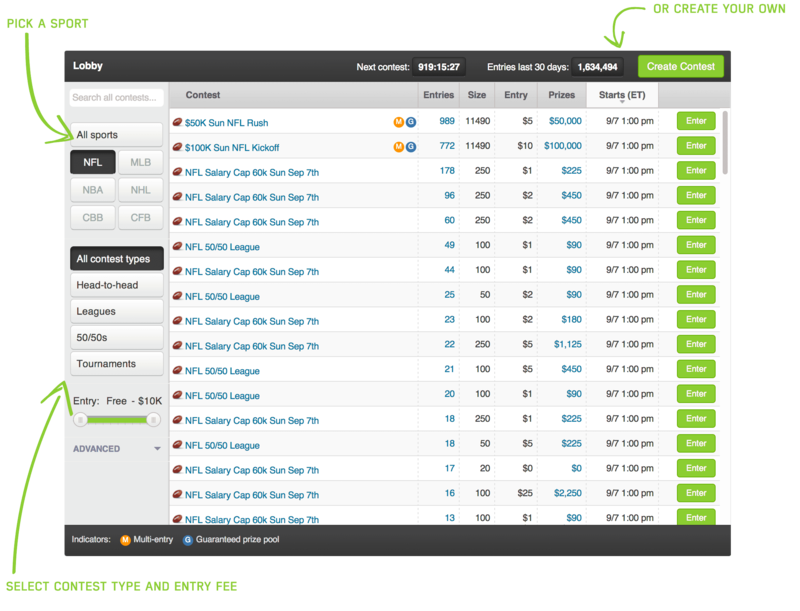 FanDuel offers users a wide variety of sports and contests based on one-day and weekly formats. The available sports are NHL, NBA, MLB, Professional Soccer and the NFL. At the moment, FanDuel is working on a Professional Golf. The types of contests include Head-to-Head, tournaments, Multipliers, 50/50s, 3-9 player Leagues, Beginner matches, salary cap 60K, and others. Entry to Weekly Depositors Freeroll is free to all users who make a deposit in past seven days. Topping the list of games is your chance of winning the NFL Sunday Million or one of the many upcoming million dollar NBA mega tournaments coming up this season. So far, FanDuel has continuously hosted the One Million Dollar Title at the World Fantasy Baseball Championships. Ninety finalists will get to visit Las Vegas each year, and the second and third prize money is half and quarter million respectively. You will likely need to win a $200 qualifier tournament to enter the championships for any major DFStournament. FanDuel started in 2009, and it earned its first paying customer in June. In September the same year, the site launched Salary Cap and NFL games. In 2010, FanDuel collaborated with Philly.com and launched five and ten player leagues. Starting with a prize pool of just $50,000 in FFFC, the website now offers WFBC prize pool of over five million dollars. From the birth of FanDuel concept in 2009, the website has grown steadily into becoming the number one site for one-day Fantasy Sports. Nigel Eccles is the co-founder and CEO of FanDuel. He is a media and online gaming veteran and the man behind two successful startups. Another co-founder is Tom Griffiths, who is presently the CPO of the company. Robin Spira is the CTO, who held the same position with Play.com and ChemistDirect. These people and other members of the team including Mark Irace (CMO), Matt King (CFO), and Christian Genetski (Chief Legal Officer) have all played a role in the success of FanDuel since its inception. Recently, FanDuel and their main competitor, DraftKings, were planning to merge companies. The two DFS giants saw the opportunity to unite under one banner in order to combine player pools, save money, and lobby together for the legalization of Daily Fantasy Sports for the rest of the United States. However, the Federal Trade Commission would not allow for the two to join forces due to the outcome of the merger giving the two companies a combined 90 percent of the entire DFS market, which would constitute as a monopoly. Both are planning to continue to campaign for complete legalization as well as expansions into other parts of the world. FanDuel provides one of the best platform for taking part in one-day fantasy sports contests. The website has steadily grown since 2009 and now holds the number one position in one-day and weekly formats for a number of sports. Fully compliant with prevalent state and federal legalities, users can expect hassle-free experience in participating in different fantasy sports contests, and winning big prizes. The website makes it very easy for even users to choose and enter different contests, and even win thousands on a daily basis. For experienced users the website offers almost limitless potential to earn in millions by taking part in multiple contests and qualifying for the different championships. 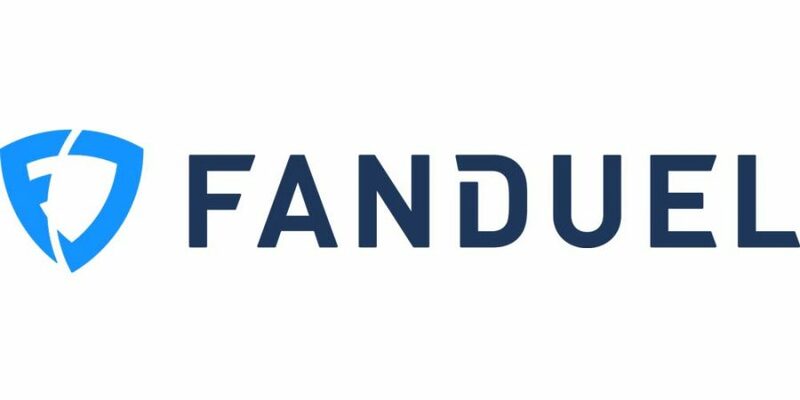 FanDuel has invested considerably in online technology and has developed excellent apps for users who want to participate in different contests on the go. The app is as user-friendly as the website, and users can enter contests, monitor live scores, and manage their accounts with efficiency. If you are new to fantasy sports or an experienced veteran, FanDuel offers major opportunities at winning some money on a daily basis. 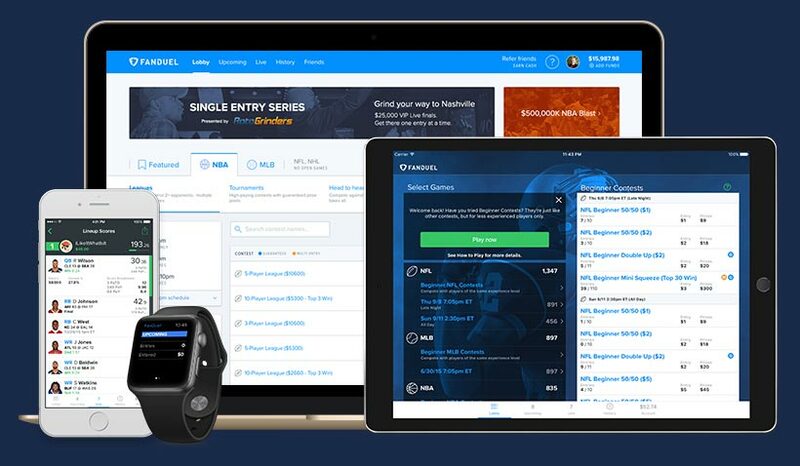 FanDuel has revolutionized fantasy sports by introducing one-day and weekly formats, which makes it possible for users to win on the same day or within a short time, instead of waiting for the season to end. Users can expect quick payouts without any hassles. You also have the chance of qualifying for the championships where the prize money is in the millions. Based on this fantastic information, if you are looking for a legal and convenient way of taking part in daily fantasy sports, FanDuel should be your top choice. "Fanduel is the market-leader for Fantasy Sports in the US. Play the biggest contests and with the highest guarantees in the industry."